I have only one public IP assigned to my hosting/private cloud, and I want to host multiple websites on a single machine. Scenario as given below. Site can be simple html or php or JSP/Servlet (Java). 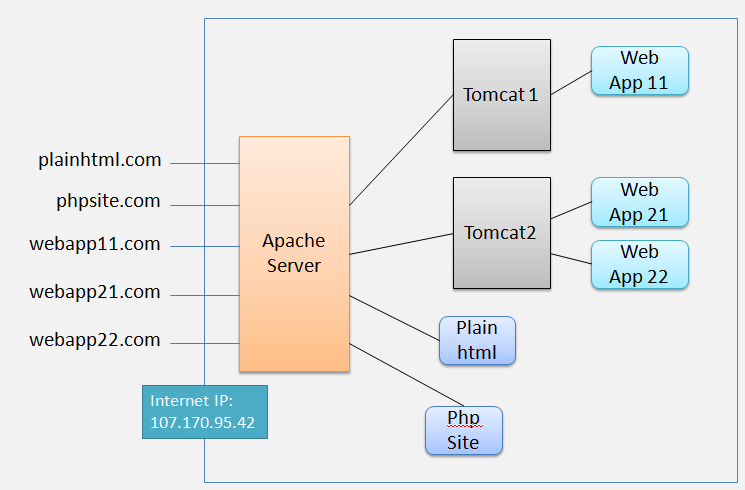 Prerequisites: Java, Tomcat, Apache, PHP installed. mod_proxy_http and mod_proxy_ajp modules are available from Apache 2.2 versions. For demo purpose we shall be using both http and ajp modules. Based on module you can use either. Enable modules in httpd.conf file. From following website names relate to scenarios mentioned in above diagram.